Italy - Some 2,800 migrants have been rescued off the Italian coast this last weekend, bringing the total number of arrivals this year to over 15,000. 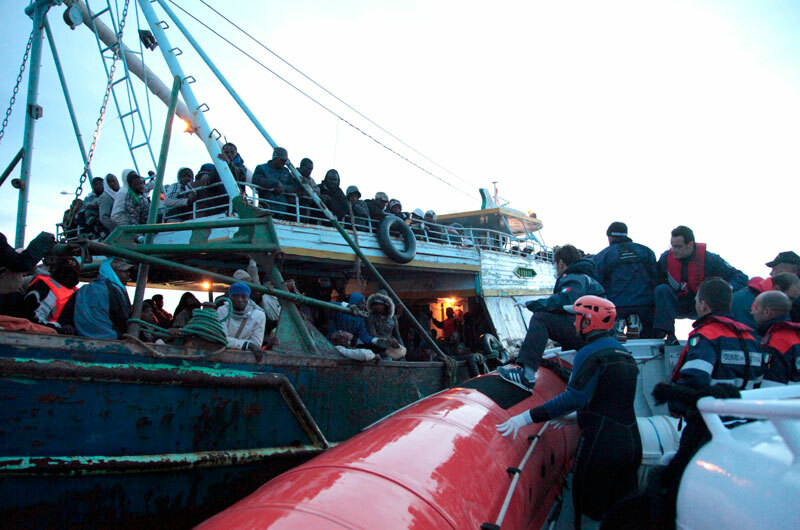 The migrants were rescued during different operations by the Italian Coast Guard, the Italian Navy and commercial ships. Many of them have already been brought to Lampedusa, Augusta, Messina, Porto Empedocle and Calabria. The majority of these migrants come from Libya and are sub-Saharan Africans, Eritreans, Syrians, Somalis and Ethiopians. Rescuers found a dead body in one of the boats. The victim may have been suffocated by the fumes of the boat’s engine, but authorities still need to investigate this death. This is the second weekend in a row that large numbers of migrants have been rescued in the Channel of Sicily. During the first weekend of April, Italy saved some 2,000 migrants as a result of several seaborne operations. The majority of operations are currently carried out by Italy, in international waters, while the EU-led Triton operation – while always active – is less involved, since it is still patrolling the area within 30 miles of the Italian coast, far from the area where boats in distress actually need to be helped. Last week the Italian Ministry of Interior released new data on migrant arrivals through the end of March 2015. In the first three months of the year Italy registered a total of 10,165 migrants arriving on its shores – a slight drop in the number of arrivals recorded during the same period in 2014. IOM staffers met some of the migrants who arrived yesterday. They reported that during the month of March the arrivals decreased because of bad weather conditions. Many of the migrants have been waiting to depart for over a month inside so-called “connection houses,” where they often become victims of brutal violence and abuse perpetrated by the smugglers.